After leading throughout to win the Group 1 Australian Guineas against his own age group on the weekend, Shamus Award now stands between Fiorente and next Saturday's $1 million Australian Cup at Flemington. The Victoria Racing Club was gifted a promoter's dream when trainer Danny O'Brien confirmed yesterday that the Cox Plate/Australian Guineas winner would renew his rivalry with the Melbourne Cup winner in the 2000m weight-for-age feature. Fiorente's fierce competitive nature helped him to a narrow first-up win in the Group 2 Peter Young Stakes (1800m) at Caulfield nine days ago and bookmakers responded by crunching him into odds-on favouritism for next Saturday's $1 million Australian Cup. Then on Saturday night when O'Brien, whose colt has earlier in the day underlined his start status, arrived at the stables after the races to find Shamus Award had cleaned out his feed bin. The trainer has no hesitation in declaring that his crack colt would take on the older horses with a one-week turnaround as his charge had thrived in similar circumstances in the spring. The only point of difference from the Cox Plate clash will be regular jockeys Damien Oliver (Fiorente) and Craig Williams (Shamus Award) taking the reins. The two horsemen are renowned for bringing out the best in each other when they lock horns. Only a half-length separated the pair in the Cox Plate after they went head-and-head before the home turn at Moonee Valley. 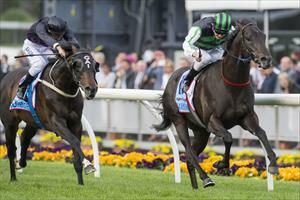 "They had a good battle there in the Cox Plate. Blake (Shinn) came up outside Chad (Schofield on Shamus Award) on Fiorente at the half-mile (800m) and he had plenty of horse and he was pretty confident," O'Brien said on TVN. "Coming round the corner, Chad zipped away and we got 1-0 up. Now let's see how we go in the re-match." Fiorente and Shamus Award will headline a field of about 10 horses, including 2012 Melbourne Cup winner Green Moon and Victoria Derby and Australian Guineas placegetter Thunder Fantasy. Others lining up include 2013 Makybe Diva Stakes winner Foreteller, Peter Young Stakes runner-up Mourayan and Irish St Leger winner Voleuse De Coeurs. Fiorente and Shamus Award are on a collision course to meet as the headline act of The Championships in Sydney next month in the $4 million Queen Elizabeth Stakes.